Research Shows It! Viniyoga Can Help Heal Your Back! Finally, a yoga-related news article I’m happy to pass on to you! It seems like yoga has had more than its share of bad press lately—from the New York Times article proclaiming that yoga can “wreck your body” to many recent articles that have been forwarded to me about a famous (non-viniyoga) yoga guru who has recently, shall we say, fallen from grace. So I was more than a little pleased when a student approached me in my Yoga for Healthy Backs class recently to say that two of her friends recently forwarded her a positive article about yoga from The Huffington Post. This article discusses recent research showing what I’ve known for years: that yoga, specifically viniyoga, can help overcome chronic low back pain. The research described is the most recent in a pair of studies co-sponsored by the National Institute of Health and Group Health Cooperative. Both studies used viniyoga—the same style taught at Whole Life Yoga, and the yoga protocols were designed by my teacher, Gary Kraftsow. One goal of the most recent study was to see if earlier benefits of viniyoga could be replicated with a larger test group. The results? Students who participated in weekly 45 – 50 minute viniyoga classes, including deep breathing and guided relaxation, experienced clinically significant improvements in low back pain and dysfunction. And those improvements were still apparent at least 14 weeks after the end of the study. Similar benefits were found in students who practiced weekly 52 minute stretching classes with 20 minutes of home stretching on non-class days. Although the article does not state this, I do believe the yoga students were also given home practices. Researchers attribute the improvements to the physical benefits of yoga—specifically, stretching and strengthening, versus any mental benefits. So I guess all the stress reduction and emotional balance we yogis experience is just an awesome side benefit! 😉 (By the way, a recent study on viniyoga for stress reduction also showed great results, but that’s a blog article for a different day). And on a personal note—the Group Health study specifically looked at chronic low back dysfunction that interfered with participant’s day-to-day activities. But I can tell you from personal experience, yoga also helps with upper back and neck pain, along with a variety of other physical, physiological, and emotional issues. If you, or someone you know, suffers from chronic low back pain, consider giving viniyoga a try! If you’re in the Seattle area, please check out Whole Life Yoga’s Yoga for Healthy Backs series. This entry was posted in Asana, Therapeutic Yoga, Viniyoga, Yoga Research on March 26, 2012 by Tracy Weber. 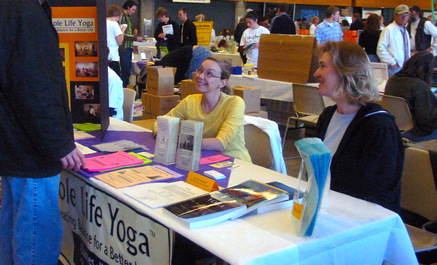 Yoga, Vegetarianism, and Free Food at Veg Fest! People become vegetarian for a variety of reasons: personal health, animal welfare, environmental stewardship, you name it. For me, it was about compassion. I just didn’t believe that an animal had to die in order for me to live. Now where’s the connection to yoga in all of this? Yogis heatedly debate about yoga and vegetarianism. Many believe that if you claim to be a yogi, you must also be vegetarian. Others, of course, disagree. The word you hear bantered about in these discussions is ahimsa. According to the Yoga Sutras, yogis must practice ahimsa, or non-harming, in all situations. For me and people who think like me, ahimsa has to include non-harming to our animal friends. For others, it’s not that simple. To be sure, ahimsa has a much broader reach. We should attempt to act without harm in all situations: to ourselves as well as others, to the planet as well as ourselves. In all honesty, I don’t have the answer. My own food choices are judged harshly by others. I’m vegetarian, not vegan, meaning I eat limited amounts of cheese. My dog and cats aren’t vegetarian, meaning some animal dies for them to live. And my husband isn’t vegetarian—but I’m rather fond of him nonetheless. In the end, each of us lives by our own values. Whether or not we choose to eat meat, we would all benefit by embodying greater kindness and compassion. Perhaps even more importantly, we should all learn to live by our own values without judging others for theirs. Now, on to the free food part of this blog entry. On March 24 and 25 (this weekend) they are hosting Veg Fest at Seattle Center, and Whole Life Yoga will be there! Whole Life Yoga teachers and students will be on hand to talk about our classes, answer questions, and give out free passes to students who haven’t tried the studio yet. And anyone who joins Vegetarians of WA at the festival gets a gift certificate for one free drop-in yoga class! While you’re there, you can taste hundreds of free samples of delicious, primarily vegan food. The vegan ice cream alone is worth it! I hope many of you stop by and see us. Bring your friends and come hungry. And take a moment this week to reflect on your definition of ahimsa, regardless of what you eat. This entry was posted in Yoga Philosophy on March 19, 2012 by Tracy Weber. Whenever I see students struggling to sit comfortably in yoga class, I’m reminded of that old Alanis Morissette song—isn’t it ironic that we come to yoga class to decrease pain, then sit uncomfortably on the floor with our backs screaming in agony. Sitting is notoriously painful for people with back pain; sitting on the floor, crossed legged, without back support, is even worse. Of course, that’s what most of us tend to do in every yoga class. There are many better alternatives. A few of my favorites are below. First, if you do choose to sit cross-legged, look down at your knees. If your knees are above your hips, then your spine is not in neutral alignment, which will lead to back discomfort. This problem can easily be fixed by elevating your hips. Fold a blanket or two and place them under your sitz bones (or ischial tuberosities, for you anatomy geeks.) These are the bony prominences between the tops of your thighs and the bottoms of your hips. Add blankets until your knees are below your hips, as in the photo below. For people without knee issues, the sitting posture below is my favorite. This is how I sit when I teach. In the first photo, the student is sitting on a block, which elevates her hips to put less pressure on her knees. In the second, she is sitting on a meditation bench. My favorite benches are sold at East West Bookshop. They can be a little pricey, but they last forever. I’ve had the one in the photo for over 11 years. We have plenty of blocks and blankets at the studio, and we also have four meditation benches. So feel free to experiment and find what is most comfortable for you. Finally, you can always lie down. There’s nothing magic at all about achieving that perfect lotus pose. Our goal is to connect the body, breath, and mind. To do that, the spine should be neutral. A neutral spine can be found sitting, kneeling, lying, or standing for that matter. While it’s true that the breath is subtly blocked in a lying position, for most people the effect is minor. If lying gets you out of pain, I say go for it! Generally, the most neutral supine position lying with the knees bent, feet on the floor, as in the photo below. The biggest risk in this position is falling asleep. So try to keep your mind alert, and if you come with a friend, tell them to nudge you if you start snoring! I look forward to seeing you at the studio soon! This entry was posted in Breath, Meditation on March 12, 2012 by Tracy Weber. A student and yoga teacher asks: I teach yoga at a health club, and I was recently given feedback by my supervisor. She recommended that I “add a higher element of fun and joy” to my yoga classes, and said that I need to be more “light and bubbly” like the other instructors. Any thoughts on this? What should I do? This is a tough one. The trick is integrating the feedback without compromising who you are as a teacher. Each venue you teach at will have its own style and energy. Teaching at a health club is not the same as teaching at a yoga studio. Teaching at a studio is different than teaching at a mindfulness center, and so on. Students also appreciate different styles in yoga instructors. Some like calmer, more introverted teachers, while others prefer ones that are more energetic and extroverted. It can be tempting to try to match people’s expectations—to morph yourself into a chameleon-like being that blends into her environment but is never herself. You have your own unique personality and character—your own voice, if you will. It is critically important that you remain authentic in your teaching. In other words, don’t try to be someone or something you are not. If you do, you will come across as fake and your students won’t like that either. So, the trick is finding a venue and audience that matches your teaching style, while continuing to enhance and build that style. That said, I do think many yoga teachers are too langhana, meaning they tend to speak softly and in low tones, with a meditative kind of energy. This is great if you work in a mindfulness center—not so great in a fitness center. And if you are on the shy side, you may back away from interacting with students, which may be part of the problem. Here are some things I would recommend trying. Connect with your students before and after class. I’m notoriously bad at this, but try to get to know your students’ names. Certainly get to know them as individuals. And check in with people after class to see how the experience was for them. This is especially important with newer students, who may have questions but not feel comfortable approaching you. Continue this connection during class. Try to have a personal moment with every student at least once during class. This can be challenging in larger classes, but is a worthy goal nonetheless. This connection can range from eye contact and a smile to working on the finer points of form. Of course, there’s a balance here. You have to intervene enough to make sure the student knows you’re present, but not so much she wishes you weren’t. 😉 You’ll learn that balance over time. Smile. A lot. Your voice and presence transform dramatically when you smile. Most of us tend to take ourselves, and our classes, way too seriously. Plus, if you smile, your students are likely to smile back. Smiling students are less likely to strain and struggle in challenging poses. Use your full vocal range. Yoga teachers tend to speak softly and in a monotone. This works well if you’re guiding your students toward meditation or trying to lull them to sleep. It doesn’t work will for fitness-oriented classes or classes in which you’re trying to build energy. Vary your vocal volume and pitch to match the energy you are trying to create. Be present for the entire room. Way too many teachers teach from the front of the room only. Move throughout the class; instruct poses from different sides of the room; stand near the back as well as the front. This will make you a more vibrant presence for the entire class, regardless of where students have placed their mats. Remain committed to your personal practice. Many, many teachers become stale and teach by rote simply because they aren’t practicing yoga themselves. To teach yoga, you have to practice yoga. If you’re not consistently practicing, start again. Take classes from teachers you find inspirational, and continue your practice at home. Know when to say when. Not every teacher is a fit for every class or venue. If you feel like you can’t teach from an authentic place, then that venue may not be right for you. In other words, sometimes the best choice is to walk away. This entry was posted in Student Questions, Teaching Yoga on March 5, 2012 by Tracy Weber.